His father took him at three to Ypsilanti, Mich, where he sang solos in church and at 12 played the trombone in the Hooper Brothers Orchestra. 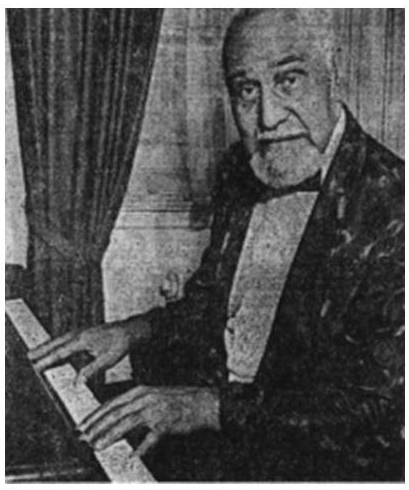 While he was studying piano 1911-21 at the Detroit Cons, he played in various local dance and theatre orchestras. He lived 1921-7 in Harlem (New York), studying 1923-4 at the Martin-Smith Music School (a subsidiary of the Damrosch Institute – later the Juilliard School). He recorded with Elmer Snowden (banjo) and Bob Fuller (clarinet) under several names, eg, the Three Jolly Miners, the Three Monkey Chasers, for Vocalion, Columbia, etc and also backed the trumpeters Johnny Dunn and Louis Metcalf, the singers Ethel Waters, Ma Rainey, Mamie Smith, and other leading jazz and blues performers of the day. 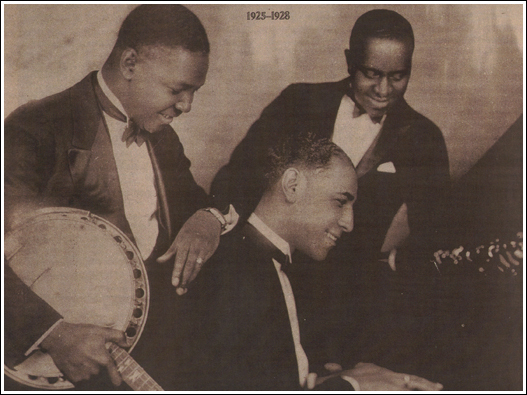 Hooper accompanied Paul Robeson on tour in 1926 and travelled as a member of Lew Leslie’s Blackbirds of 1928. 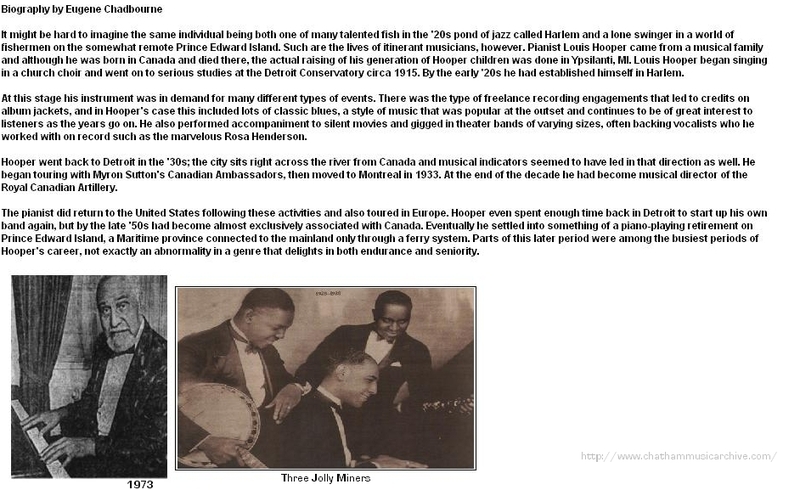 Hooper returned to Canada in 1932, living first in Toronto – he performed at the 1932 CNE – and then, as of 1933, in Montreal, where he joined Myron Sutton’s Canadian Ambassadors, an all-black dance band active in Quebec and Ontario. Hooper formed and conducted a male choir, the Hooper Southern Singers, in concerts and on CKAC radio. He also played in local dance and jazz bands and taught piano. Oscar Peterson was one of his pupils. After a term in Europe during World War II with the Royal Canadian Artillery in which he served mainly as a pianist and entertainer in charge of Canadian concert parties, Hooper returned to Montreal, playing and teaching in increasing obscurity. In 1962 he was rediscovered by Montreal jazz enthusiasts and subsequently celebrated as a surviving link to the early history of recorded jazz. He was honored by the International Association of Record Collectors in 1973 and by the Canadian Congress of Collectors in 1977. A new recording, the LP Lou Hooper (1973, RCI 380), a collection of ragtime pieces, included his own Black Cat Blues, The Cakewalk, South Sea Strut, and Uncle Remus Stomp. According to Tex Wyndam in Coda (March 1976): ‘Although slightly on the academic and restrained side, the solos have a firm, bright rhythm, are cleanly executed, and generate a mood of confidence and good cheer’. Other Hooper rags date to as late as 1975, the year in which he joined the faculty of the University of Prince Edward Island. He also wrote a ballet, Congo, staged in 1976. In the summer before his death he was a regular performer on CBC (Halifax) TV’s ‘The Old-Fashioned New-Fangled Vaudeville Show’.